Sta nford AIA Society has a long history with Stanford archaeology, actually beginning before the national organization in 1879. 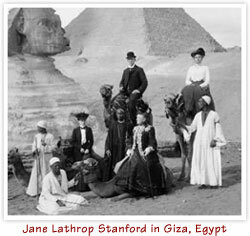 Archaeology was by design part of Stanford University's original academic blueprint because of Leland and Jane Stanford's historic travels in the 1870's with their son Leland Jr. to sites in the Mediterranean, Turkey, Egypt and around the world. The Stanfords visited the site of Troy in its early stages of discovery and were astonished at its historicity far beyond its presence in Homer and epic. Thus they were also dedicated to building a museum for Stanford as the then-new academic discipline of Archaeology became an institutional part of the core curriculum of the new university in the 1890's and has remained so throughout more than a century at Stanford. 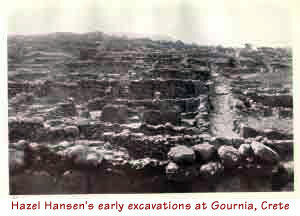 Early Stanford archaeologists like Professor Hazel Hansen (1899-1962) taught archaeology to generations of students, involving many on her excavations in Crete and in Greek islands like Skyros as a preeminent Aegean prehistorian. After her B.A. graduation from Stanford in 1920 and M.A. in 1921, Hansen went to the American School of Classical Studies in Athens from 1922-25 and finished her Stanford Ph.D. in 1926. 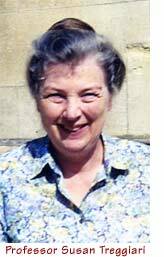 She taught at Stanford in Classics from 1928 onward, with almost fifty years of teaching archaeology as a professor until her retirement and continuing to her death in 1962. 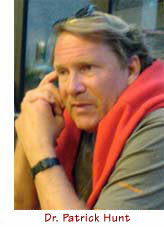 Involved with the national AIA for years, speaking at the national annual meetings and writing for its publications like the American Journal of Archaeology, Professor Hansen, after being an officer of the nearby San Fran cisco AIA Society, also helped to found Stanford's AIA Society in 1960 as a charter member and was one of its first officers. 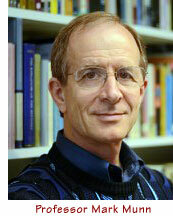 The Stanford Classics department has thus had a vital role in Stanford AIA since its inception. 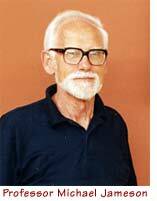 Other indispensable Stanford AIA charter members include Classics Prof. Michael Ja meson (1924-2004), discoverer of the fifth century BCE Themistocles decree in 1960 and surveyor of the Greek Argolid and excavator of the city and submerged Greek port of Halieis, among many other accomplishments. In addition, other society charter members include Nancy Delia Palmer, who also presided as one of the first National AIA Society Trustees from 1985 and was recipient of the prestigious National AIA Martha and Artemis Joukowsky Service Award in 2010 after serving t he Stanford AIA society for 31 years in various offices. 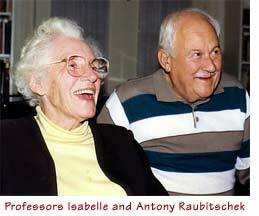 Professor Antony Raubitschek (1912-1999) Greek epigrapher and archaeologist at Isthmia and Corinth and his wife - also a professor - Isabelle Kelly Raubitschek after teaching at Yale and Princeton came to Stanford University Classics and became heavily involved as pillars in the Stanford AIA Society from 1963 onward and continuing until Antony's death in 1999. Stanford AIA continues to host an annual Antony and Isabelle Raubitschek Memorial Lecture in honor of the Raubitscheks, who were generous to Stanford and to the Stanford AIA Society. Professor Mark Munn and his wife Dr. Mary Lou Zimmerman Munn, who was also a curator at the Stanford Museum (now Stanford Cantor Center for the Arts), were officers for Stanford AIA in the 1980's to early 1990's, both also serving as co-directors of Stanford-in-Greece from 1979-92. 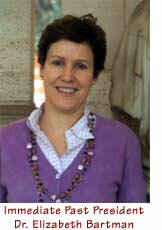 Emeritus Stanford Classics Prof. and Oxford Classics Professor Susan Treggiari, eminent Roman historian, having returned to Oxford University and recently retired there, also served as Stanford AIA President through the mid-1990's. In recent years, many Stanford undergraduate students – at least 100 - have participated (many with scholarships from Helen and Peter Bing) in the Stanford Alpine Archaeology Project 1994-2012 directed by Dr. Patrick Hunt and sponsored by the National Geographic Society in 2007-2008 for the Hannibal Expedition, an ongoing field project tracking Hannibal since 2012 in attempting to match the text of Polybius and alpine topography and offering regular field reports to Stanford AIA as well as to AIA nationally. Along with Stanford graduate students, many Stanford AIA community members have been involved with this Alps project and other Stanford projects, including the Durham Binchester Project. Stanford AIA Society continues in the 21st century to offer world-class archaeological pioneering research to the university and community at large, having been fortunate to host Chairs of Stanford Classics such as Professor Richard Martin and Professor Walter Scheidel as well as peerless global archaeological leaders and pioneers at Stanford like Professor Ian Morris and Professor Ian Hodder, Professor Richard Klein and Professor John Rick, among many others. University Archaeologist and Director of Heritage Services, Stanford's Dr. Laura Jones regaled us this academic year (2013-14) with over 100 years of Stanford archaeology, in which Stanford AIA has played a vital role for over half a century. Stanford AIA Society received a national certificate celebrating over 50 years as a chartered society in fall of 2012, presented by national AIA President Elizabeth Bartman in a special lecture event on Stanford campus.